I don’t recall spending time on the beach opposite Edgartown when I was a kid. Instead I made my parents ride the Chappy Ferry back and forth all afternoon. Not sure that’s a good idea today. It is $4 per person round trip. Back then the ferry men wore change dispensers on their belts. Then again, it has been 20 years. When I drew out this composition, I wasn’t thinking much about what to do next, other than setting the orange sails against the blue afternoon sky. 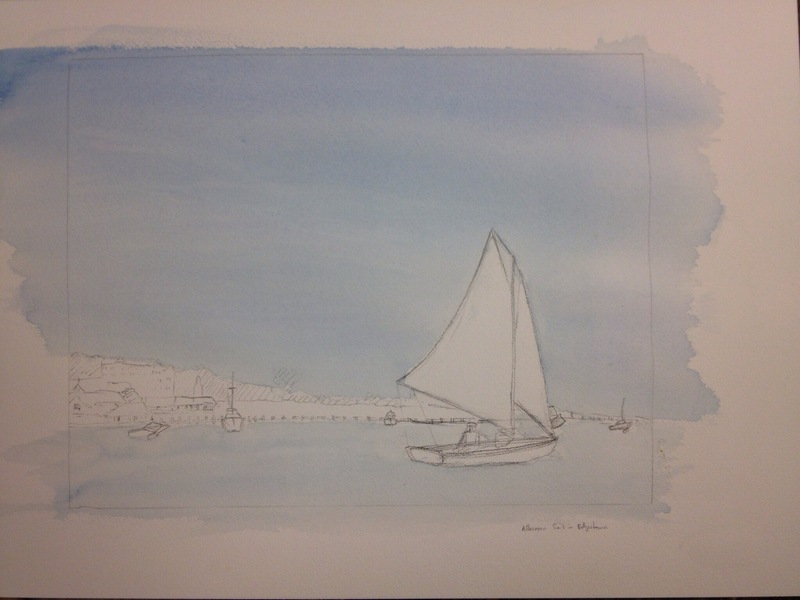 David Tripp commented that he saw a Hopperesque watercolor coming from this, which prompted me to look back at some of Hoppers sailing paintings, and gave me some direction. I am going to keep this one simple and straightforward–compositional–with some elegiac tones. To start, I laid in a basic muted sky of diluted Prussian Blue and Ultramarine, and base wash of the same for the water, over which I will lay the waves and reflection of the boat and sails.